The SpaceX Falcon 9 rocket carrying the Dragon space freighter rocket lifts off from Cape Canaveral, Florida. SpaceX's Dragon cargo capsule is hauling a lot of science gear up to the International Space Station, including experiments for the orbiting outpost's first one-year crew. 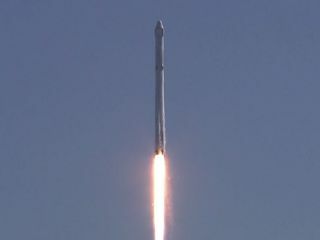 The unmanned Dragon launched into space Tuesday (April 14) atop a SpaceX Falcon 9 rocket, which lifted off from Florida's Cape Canaveral Air Force Station. It is due to arrive at the space station at 7 a.m. EDT (1100 GMT) Friday, April 17. Astronauts will grapple the capsule using the station's huge robotic arm, then begin offloading its 4,300 lbs. (1,950 kilograms) of cargo. "It's allowing us to make a leap from [missions of] six months to a year and project out what we need to do to protect humans over longer periods of time," Porterfield said during a prelaunch news conference Sunday (April 12). Dragon's cargo also includes an Italian-made "ISSpresso" space coffee machine, 20 mice and many other items. The rodents are flying as part of an experiment that will look at how extended periods in microgravity affect bones. Space station crewmembers will X-ray the mice and dissect them, NASA officials said. Dragon was originally supposed to fly parts to change a docking port to prepare the orbiting lab for commercial vehicles, but that payload was shifted to a later flight to give astronauts more time for science, said Kirt Costello, deputy chief scientist for the International Space Station. "This [rodent] investigation requires a significant amount of crew time," Costello said during another news conference on Sunday (April 13) "We did have plans to fly a payload in the trunk; that payload would have taken a significant amount of time to install on orbit as our international docking adaptor system." Dragon's cargo also includes experiments designed to improve medicine and robotics. One is a crystal-growth study from Paul Reichert, a scientist at Merck Research Laboratories in New Jersey who previously flew protein-growth experiments on 11 space shuttle missions. Reichert said he hopes his process will create larger and more uniform crystals for a class of drugs called biologics. Many of these can only be delivered by IV at a hospital, increasing costs and stay time for patients. Reichert's aim is to make biologics that could be delivered by a simple injection, perhaps at home or at a doctor's office. "That would have a significant impact on the ease of administration and the comfort of the patients," he said. Dragon is also flying a synthetic muscle (an electroactive polymer) to the station, which will remain there for up to 80 days to test its resistance to radiation. The long-term aim of the project is to create robots with this synthetic muscle, but first investigators want to compare how well it performs compared to metal.